Sweet Jesus. That's exactly what a friend of my sisters exclaimed during his first encounter of what was then my sisters birthday cake but what is now just a collection of tantilising 2D images on my laptop. I'm reliving the entire thing from the comfort of my Airbnb in Berlin, but Berlin's got nothing much to do with this recipe so I'll save that for another time. The cake is the real reason we're all here, am I right? And the aim is for you all to get a Sweet Jesus exclamation out of as many people as possible, okay? Let's go. Sometimes you just need a birthday cake, and you need it fast. An example of one of these 'sometimes' was last week when I spent the day with my sister and her friends to celebrate her thirtieth birthday. We were on our way home for a quick freshen up of spa faces (you know?) and a light meal before heading to partytown in the form of our local, when the topic of the cake i'd made our other sister for her birthday came up in conversation. It was really good guys, but I literally threw things at the food processor hoping they would warm to each other and get along. It happened, but it was a miracle, a miracle. I wrote a few notes on my phone as i went along but the measurements were not what mattered here, just the end result, and so the specifics were pretty blurry. It was all about taste and texture and I might as well have been blind, which is all good and pretty clever at the time, but not when you're challenged to recreate it another time. That's when the feeling clever wares off. Never the less, as my sister and her friend reminisced about the cake gone by, I took my 1.5 hours, that same food processor (maybe it remembered?) and whatever I could find in the kitchen and I made it happen. Again. I do work well under pressure, but daaaamn, I didn't know I worked this well. This time, wrapped up in a frenzy of searching and blending and writing and tasting, I somehow managed to add a frosting to the initial version, and thank god I did because the frosting is what really makes everthing you see going on here happen. 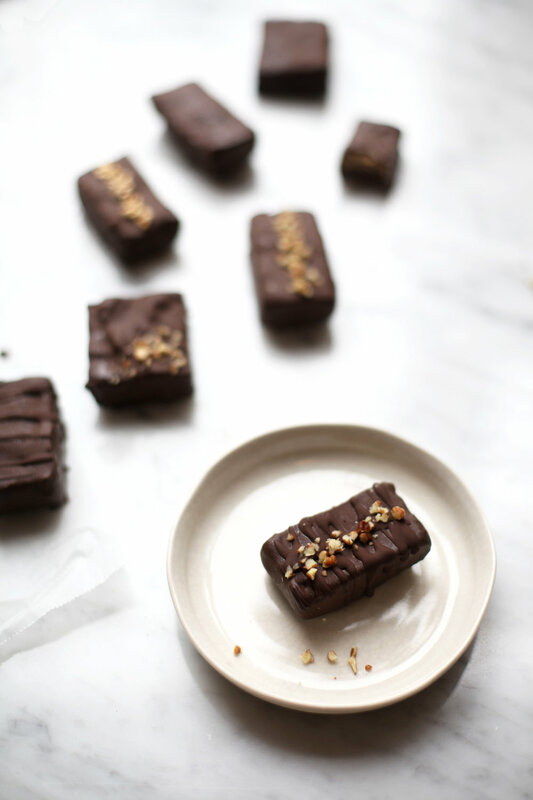 It's inspired by the crispy, creamy, nutty, chocolatey vibes of fererro rochers, which may seem impossible to achieve with natural ingredients, but is simply what happens when roasted hazelnut butter meets thick, creamy coconut milk. We're all familiar with the phrase having your cake and eating it, but this recipe goes even further and is all about having your cake and your fererro rocher. It's not, however, going to be like eating a fererro rocher. It's going to be so much better. With a brownie-like cake layer (infused with maca and pure cacao) and a seriously smooth topping, it puts those poxy mouthfuls of wafer to shame if anything. Although, I'm grateful for the inspiratoin of course, otherwise where would we be? So thanks Fererro. + You'll notice in the ingredients list that there are a few loose options, as certain ingredients in version one were replaced in version two with whatever I had on hand. I can confirm that all options worked perfectly well without much alteration to the flavour, and no alteration to the texture. So approach this recipe freely and tailor it to your own supplies). Preheat the oven to 150c. Place the hazelnuts from the frosting ingredients list on a baking tray and bake for 10-12 minutes until they begin to brown slightly. Meanwhile, start pulsing the nuts - including the ground almonds - with the cacao nibs in a food processor. 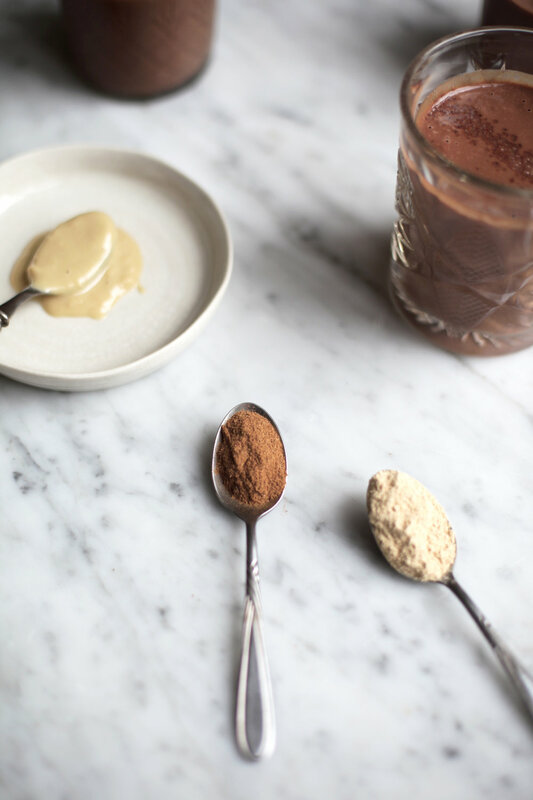 Once the ingredients begin to come to a fine flour-like consistency, add the salt, vanilla, cacao powder, maca and other superfood powders and pulse to combine. Next, split the dates in half to remove their stones and place them in a small bowl. Cover with freshly boiled hot water and leave to stand for 1-2 minutes. Add the coconut powder or flour, syrup of choice, almond butter and coconut sugar to the food processor and blend for another minute, first on a low speed, and then on the highest speed for the final 30 seconds. Next add the dates to your food processor, squeezing each one to remove as much liquid as possible. Blend for another 1-2 minutes on a high speed, scraping down the sides and blending continuously until the mixture is smooth and begins to form a doughy ball. If you haven't already, check on the roasting nuts and remove from the oven. As they cool, transfer the mixture into you choice of cake tin, dish or even a muffin tin to make smaller individual cakes. I scattered the bottom of my dish with cacao nibs and pressed the brownie mixture onto it which adds a subtly crunchy base layer. You could also add crushed nuts, or nothing at all. Press the dough into your mould/s, making sure it is even and compact. For the frosting, you can either blend the nuts with their skins or remove the skins by placing the nuts inside a teacloth and rubbing them together for around 1 minute which will encourage the skins to flake away naturally. Whichever you choose, add the nuts to your fresh and cleaned food processor and pulse on a high speed until buttery. This can take up to 10 minutes, and may take some scraping. Add the melted coconut oil and almond butter as the machine is still running. If your mixture still seems dry, these ingredients will help it to loosen up and combine. Now you should have a nut butter consistency. Next add the coconut milk, coconut powder, salt, vanilla and your sweetener of choice. Blend for a further 30 seconds to combine and then spread the mixture over the cake layer. Smooth with a spoon or spatula and if you wish, top with your choice of chopped nuts, superfood powders or cacao nibs. 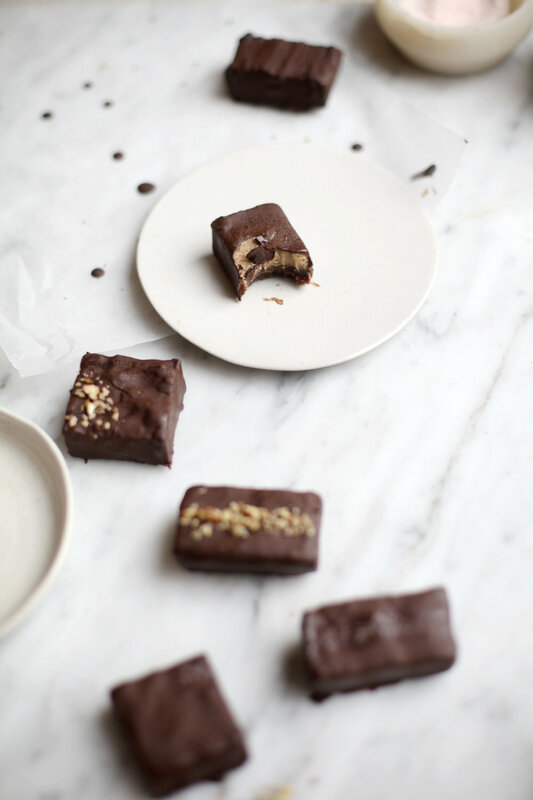 Place in the freezer to set for at least 30 minutes to set - this is what gives it it's chewy, decadent texture. Store here until ready to serve and remove 5 minutes before you plan to enjoy it. + If you don't end up making a cake of this recipe, you can break it into two. The cake mixture can be made into bars or balls, and the frosting can be used as a nutella alternative for things like pancakes, crepes, porridge or other desserts. A few weeks ago I finally found the time to make a healthy version of a former addiction of mine - millionaire shortbreads. I used to eat one almost every day from the dinner ladies at school, and used to buy tubs of the mini ones from Sainsbury’s or Marks & Spencer’s. They were sharing tubs, but if no one else was around to help me out then there was no sharing to be done. Anyway, as such a big fan of theirs, I’d wanted to have a go at making these with a model mange tout twist for ages, but felt it was something that required proper time and effort. And I was right; making healthy versions of your favourite unhealthy addictions is possible, but it’s not effortless. The image above was unexpectedly shocking to most of my followers on Instagram. The reaction it got was insane - people refused to believe their eyes. The words ‘healthy’ and ‘caramel’ just don’t go together in the same sentence. And something that looked so good and so goey and chocolatey and delicious, looked pretty out of place on my account among raw salads and smoothies. I worked hard on this recipe and have been perfecting it since i first made it - hence my delay in uploading the recipe. I made them twice in one week and once for a dinner event and they went down so well, with everyone. Even my flatmate who normally doesn’t like caramel (!?) liked these. My version of this infamous snack is even more flavoursome that the shop bought millionaire shortbreads i used to demolish. Looking back, the shortbread was always a little dry, crumbly, powdery and sickeningly sweet. The caramel was hit and miss and in most millionaire shortbreads i got from cafes or restaurants was too sparse and extremely dry. The chocolate tasted artificial and was also far too sweet considering the amount of caramel it sat atop. 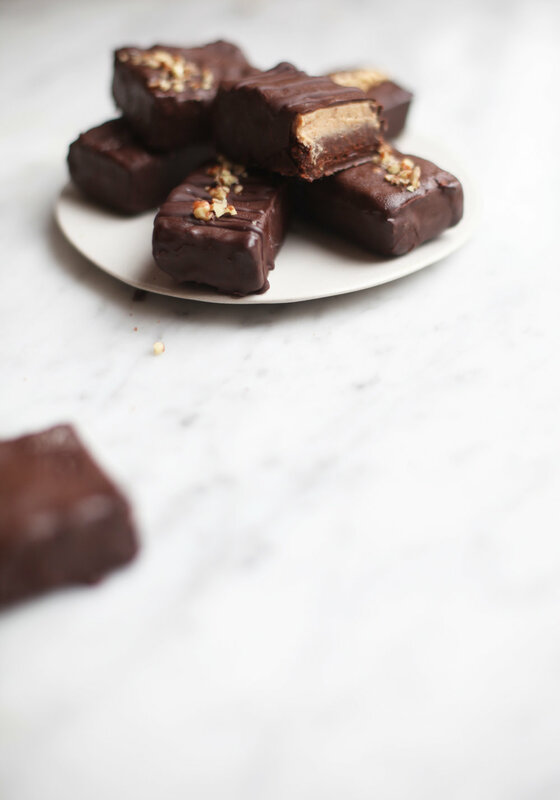 These millionaire shortbreads are intensely rich due to the darkness of the raw cacao. They are incredibly creamy due to the coconut milk in the caramel, and the base has a wonderful crunch with a simultaneous melt-in-the-mouth texture, due to the coconut oil. I took inspiration from raw dessert recipes that rely on freezing and chilling to set certain ingredients. I baked the base and boiled the caramel but once all the ingredients were layered together, i let the freezer do its thing. The base becomes even crunchier, the caramel becomes chewier and the chocolate is the perfect way to top it off, with a rich, creamy crunch. The added nutrients, vitamins, antioxidants and superfoods that come from the pure ingredients used in these shortbreads are what really makes them special. The coconut in the recipe has incredible health benefits from aiding digestion, regulating blood sugar levels and reducing inflammation in the gut. Cacao is one of the richest sources of the purest energy and contains nearly twice the amount of antioxidants found in red wine and three times that found in green tea! 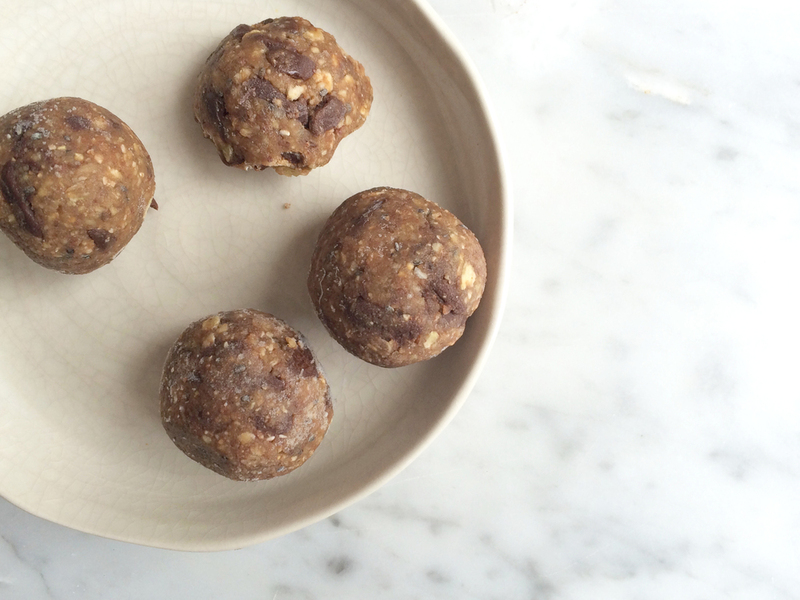 So, make these with guilt-free confidence and eat them as regularly as you feel necessary. They are full of essential vitamins and nutrients and very low in sugar - the content of which you can control to your personal needs/preferences. Enjoy with a green tea or as a midday snack or serve as a light dessert with homemade coconut or cashew cream and berries. Start by making the base. Preheat the oven to 170c. Whisk the oil with an electric whisk and add the sugar, vanilla, salt and cinnamon. Whisk together for 1-2 minutes, until the mixture becomes light and fluffy and everything is combined. Add the water - a little at a time - and whisk again. Now take a wooden spoon and add the flour to this mixture. Stir gently to incorporate the flour and when it becomes too dry, use your hands to knead it. (If the dough is too crumbly, add a little more water). Roll the dough into a ball and squash with your hands for 2 minutes to make sure it’s compact. The heat from your hands will make the oil work into the flour. Now press the dough into a lined baking tray. Either grease the tray with coconut oil or line the tray with baking paper and grease that. Press the dough down with back of a spoon or your hands until it is fully compact in the tray (this will avoid crumbling). This took me about 2 minutes, so make sure you work at it otherwise your base may collapse. Place in the preheated oven and bake for 18-20 minutes, until it begins to brown at the edges and on top. Remove from the oven when cooked and place in the fridge to cool whilst you make the caramel and the chocolate. For the caramel, make the dates into a paste first, if you are using. Set aside and place the coconut palm sugar and coconut milk in a medium saucepan. Bring to the boil and simmer for 5 minutes before reducing the heat. Add the salt, vanilla, almond butter and chia seeds, whisking continuously. Lastly, add the coconut oil and the date paste and whisk vigorously to combine. It should start to thicken round about now. Simmer for 25 minutes, whisking every 5 minutes or so. After half an hour, pour into a heat proof bowl and place in the freezer. After 15 minutes, mix the caramel in order to avoid any of the coconut oil or cacao butter from separating. Then pour it onto the shortbread which should be perfectly cool now. Spread the caramel evenly over the base and again be sure to press it down with the back of a spoon to make it compact. Place in the freezer for about 15-20 minutes, whilst you make the chocolate. For the chocolate, place a heatproof bowl over a saucepan filled with boiling water. Add to the bowl the cacao butter and stir with a whisk to encourage it to melt. Once it is more or less melted, add the cacao powder, salt and agave. Whisk until everything dissolves and combines and then remove the bowl carefully from the pan. Pour over the caramel layer and spread evenly, but do this quickly so as not to melt the caramel. Place it back in the freezer for 15 - 20 minutes so the chocolate hardens (the freezing won’t effect the shortbread). When the chocolate is set and the caramel seems tougher, remove from the freezer and store in the fridge until ready to serve. Slice into rectangles or smaller squares depending on how you want to serve them. This is a much more straightforward variation and like more raw desserts, relies heavily on your blender and your freezer. For the base, place the nuts in a food processor and blend for half a minute to make into a floury consistency. Next, add the dates, maca, coconut oil and almond butter and blend again, until sticky and almost smooth. Use a spatula to scrape the raw dough from the blender into a rectangular dish or tray. Press down firmly until compact and set in the freezer. Rinse the blender and add all of the caramel ingredients, apart from the chia seeds. Blend until everything is smooth and add a little extra melted coconut oil if the mixture is too thick. When the mixture is smooth, scrape out and pour onto the base which should be setting nicely. Spread evenly and return to the freezer. Lastly, place a heatproof bowl over a saucepan filled with boiling water. Add the cacao butter to the bowl and stir with a whisk to encourage it to melt. Once it is more or less melted, add the cacao powder, salt and agave. Whisk until everything has dissolved and then remove the bowl carefully from the pan. Pour over the caramel layer and spread evenly. Return to the freezer and leave for at least 1 hour. You can store them in the freezer too, as they will stay firm but won’t turn to ice. Since changing my diet i have never valued my freezer more! These are pretty much irresistible. They’ve been in my freezer for three or four days now and every time i go to the fridge i find myself also going to the freezer for a cube of brownie. I thought they’d be pretty average and have nothing like the gooeyness of the average brownie. I expected them to be quite mediocre and very similar to those date bars you get in health food shops. However, they were completely different. These brownies are rich and subtly sweet. They are not cakey at all because there is no flour, cooking or rising involved. But i always liked the more dense, slightly uncooked middle of a brownie anyway. These brownies are what you would get if you took the undercooked part of a brownie and left it in the fridge to harden. They are rich and creamy and they literally melt in your mouth, because you set and store them in the freezer. 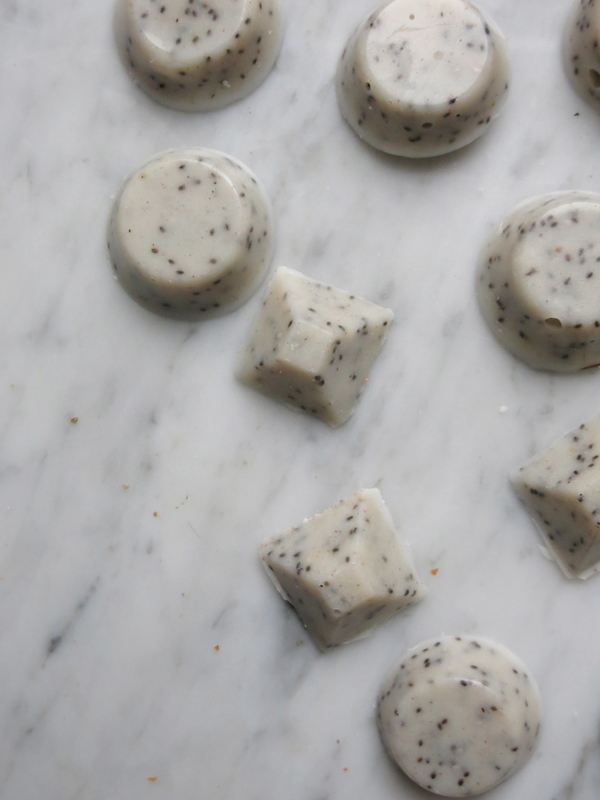 They are incredibly chewy and have a slight crunch to them if you choose to include the chia seeds and cacao nibs. I’m not going to lie, i would probably be inclined to grab a normal brownie if i had a choice between the two, but i know for a fact i will never make a normal brownie again. These raw brownies are so easy and they make you feel amazing. The only sweetener comes from the dates and the cacao works at giving you so much pure energy and positivity. The coconut oil aids digestion and assimilation of all the amazing vitamins and nutrients from the other ingredients. I’ve been having a cheeky mouthful (or two) in the morning whilst i make my hot water, fresh lemon and ginger; a wonderful start to the day. Blend all of the ingredients together, except for the nibs, on full speed. Blend for 2 minutes, scraping down the sides of the blender to make sure everything is incorporated. Add a little water if the mixture is being stubborn and seems to thick to blend. When completely smooth, scrape the mixture out of the blender into a bowl. Add the nibs and any superfoods you like, along with chopped nuts if you’d like to add them. Mix to combine and then press into a glass dish or some kind of tin. It may make sense to grease the dish first with a little coconut oil to prevent the brownie from sticking. I covered my dish in cling film so the brownie was easier to remove. You could use baking paper too. Press the mixture down until it is compact. Use the back of a spoon or spatula to really press down hard. Place in the freezer to set for 1 hour. Alternatively, you could chop the brownie into small squares and either leave them this shape or roll them into truffle balls with the warmth of your hands. 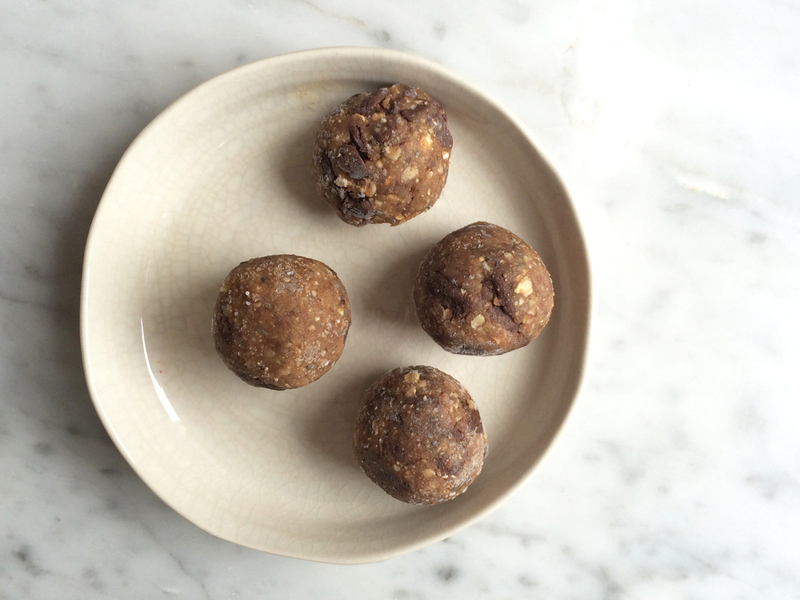 Then roll them through some raw cacao powder, maca or desiccated coconut and re-set in the fridge. Give as a gift this Easter or for any occasion for that matter. I’ll be taking them home to my parents in the form of fudge squares. 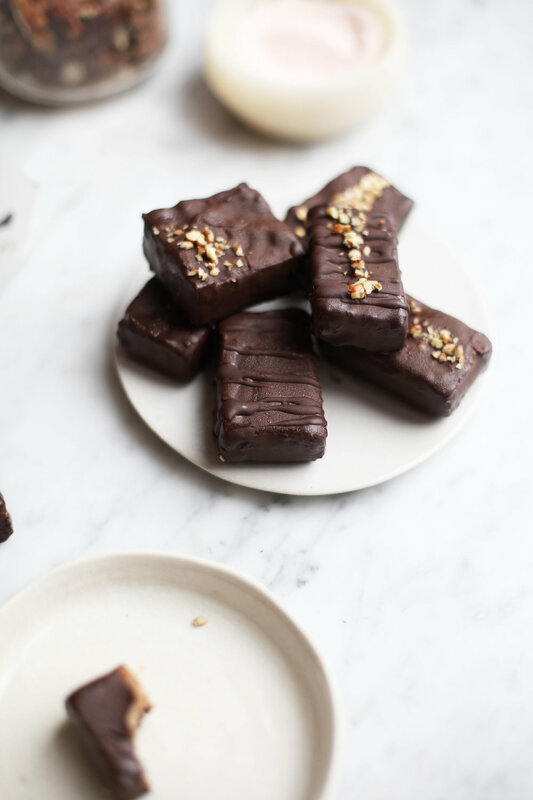 + You can also top these with cacao frosting which will solidify as it sets, adding a crunchy texture to the brownies and intensifying the chocolatiness.